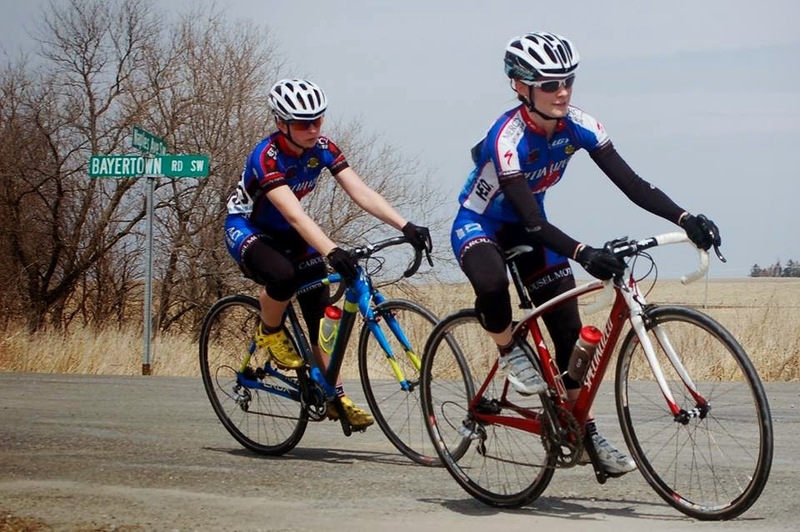 Yesterday was the Hills/Iowa City Spring Classic, which is a pretty hilly gravel race. So today, I was thinking I might be pretty tired and sluggish on my townie ride to work, but instead I found myself with a little extra spring in my step pedal stroke and just smiling away. I was trying to think why I was so unexpectedly happy, I mean, it was Monday morning and I hadn't even had my coffee yet, and then I remembered that I put in a hard effort on the bike yesterday. That was it! It almost never fails that I'm in a really bubbly mood the day after a hard ride or race. Does anyone else wake up the next day and just feel little extra happy? I hope you do, because it's great! I'm glad I was in such a good mood today, because I've been severely lacking motivation to race these past two weekends. My fitness at this point is still questionable, and while I enjoy grave rides, I don't love gravel races... I knew I would do the race, but was looking for any excuse not too. I told myself it would just be a nice hard ride, which I would do by myself if I didn't race. And riding with others usually wins! Getting ready to race with these lovely ladies :) Photo by Mark Beatty. The whole group of racers rolled out from Hills, IA to the start of the race a couple miles to the west. The officials were great, and got us all started really quickly once we arrived. One of the women, who had gone the Gent's Race the day before, fell behind quickly along with another girl who was new to racing. Robin, Andrea, Alijah, and myself all hung together until the rollers where Robin kept a fast pace and rode off ahead. The group was down to just three us of. I pulled us the rest of the first lap and then said someone else should take a turn. After one small hill to the start/finish I was back on front pulling. I don't know how, but I managed to drop my chain and had to stop and fix it on the second lap. I felt like it took forever to get it back on, I was thinking about how much work it would be to catch back up to Alijah and Andrea when I saw them riding towards me?? I hoped back on the bike and told them they should have kept going!! I felt really bad that they had stopped, so I jumped right back on front to pull. I would have been working hard solo for a while anyways! One we hit the pavement section, I tried to let someone else pull again and the pace went down to about 11 mph. I couldn't stand to go that slow so I got everyone to echelon until we hit the gravel, and then I was back on front. I gave up on trying to get anyone to share the work and ended up spending most of the race pulling on the front. On the last lap, I attacked on the pavement and Alijah jumped up to me and then Andrea caught as well. Andrea and I rode side my side going into the final climb. She went ahead and I wasn't sure if I had the legs to out sprint her. Alijah came around both of us and I put all my remaining strength into getting to the finish line, barely ahead of Andrea. She is one strong lady! Yes, that's my "grr" face, haha! Photo by Mark Beatty. It was a fun race, and I was happy to have the strength to be on the front so much, especially with all the climbing. I got my hard workout it! Robin & I cooling down after the race. I love this lady! Photo by Tara Coady.